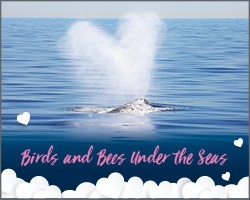 Enjoy fun learning stations, plus a special gray whale love talk by Diane Alps, a cetacean scientist. This family-friendly event is FREE for members with a reservation. To RSVP, call (310) 548-7593 or email membership@cmaqua.org by February 8. The Gift Shop will stay open late, so you can finish your Valentine’s shopping too! Also, don’t forget to save the date for the Friends Members Only Grunion Run coming up on Saturday, April 6. This exclusive members event is one more great reason to become a Friends of CMA member today!